gusts of wind almost knocking me off my feet while just standing, making me take 3 hours to walk 15km. a castle with a restaurant which served a classy, multiple-fork meal, and a wine list several pages long. the beginning of the Pyrenées, with tough climbs and winding roads along the coast. Scenery: Farms, forests, major cities, small villages, beaches, lakes, rivers. Animals: Horses, cows, chickens, sheep, poneys, dogs, cats. No bears. Here is a list of the different cities I stopped in, with the distance traveled that day as reported by my gps. Click here for an interactive map (which is based on driving directions, not my actual path). You can click on the distance for each step, to see an interactive map of the actual path I took for that day. 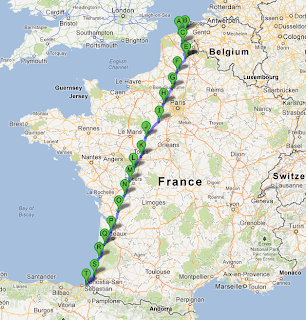 * The distance for day 13 to Maisonnay is estimated, since I didn't have my gps on for part of the day. crossing California from south to north via the 5 freeway is about 1280km. 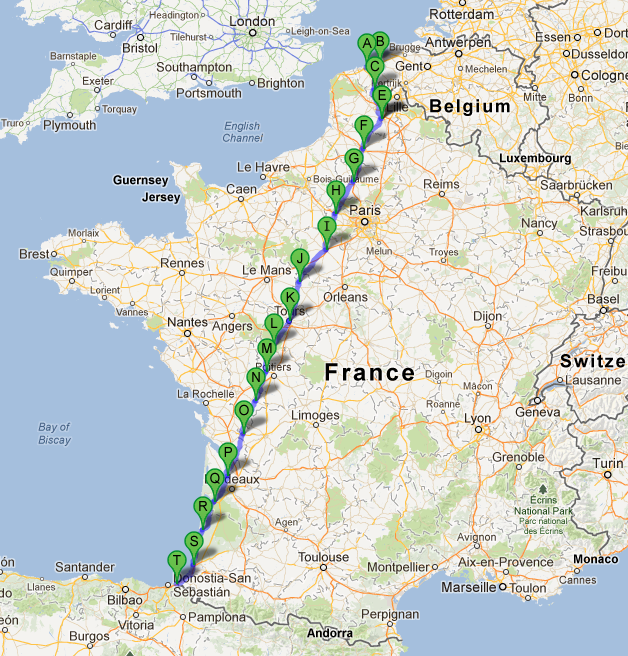 driving from Paris to Madrid is 1263km. in 2011, a dog, Fadiddle, was found about 1200 km away from his Salt Lake City Home, in Oceanside, California. The dog had been wandering around for about 8 months. I don't feel so slow now. 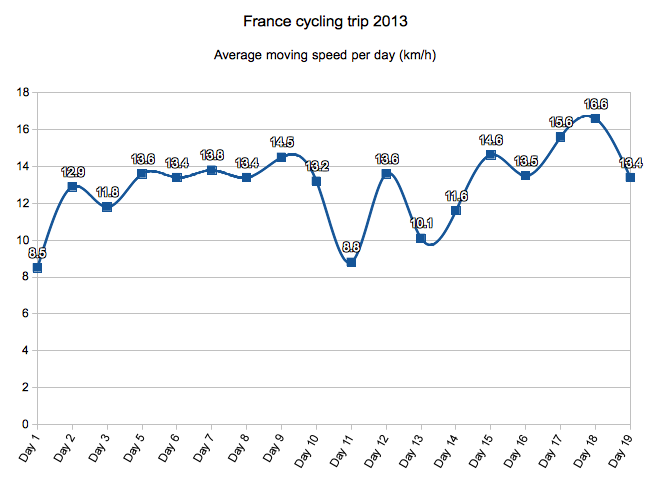 Here are some interesting and less interesting numbers about the distances, times, and speeds during this trip. I had difficulty including videos in this blog from the road. So now that I'm back at a real PC, I can share them! This speed radar shows how fast I was going. For much of the trip, the scenery was open fields. The first forest I cycled through was Chef-Boutonne. A video on my last day, as I neared the end of the forest bike paths, before entering Bayonne. This trip, I was very focused on "finishing" the trip. I had a goal to cross France from the Belgian border to the Spanish border. I think the next time I go on a bike tour, I will simply choose some nice bike paths, and just plan to spend X days in the area, without a specific goal of a destination to reach. I really enjoyed the long distances of bicycle paths in the forest, in Aquitaine, so I might think about coming back to that area. But there are surely many other similar possibilites in France or not too far. Boyyyy, in all these videos you even met a car. hahaha. Well, I am happy and relieved that you made it home safely. I am very proud of you, starting and finishing adventures. Now that Margaret Thatcher is dead, her nickname of 'Iron Lady' belongs to you. Haha there were actually plenty of cars, but I guess I didn't think posting pictures of cars on busy streets would be as nice as the scenes with quiet roads. 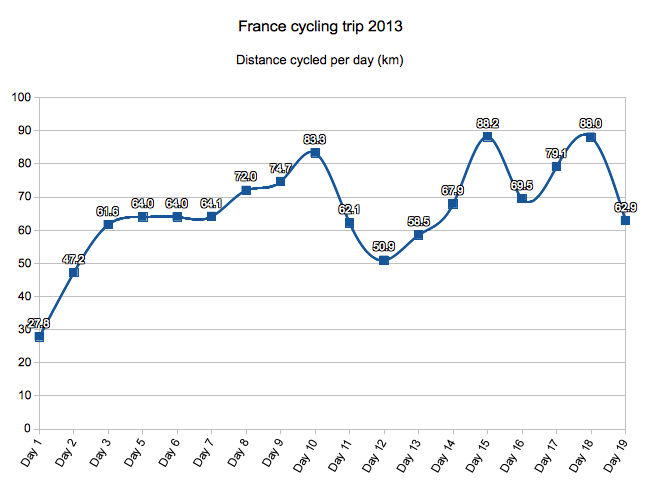 I didn't take any time to comment your cycling trip on your previous notes, but I had a great pleasure to read them all ! The very first 40 mile bike ride I did around town I uploaded to the same Garmin website and I named it "Epic 40 Mile Ride".....but now I really know what an "Epic" ride is. Thanks for sharing!!! Your ride WAS epic :) I just checked the stats (you sent me the link by mail a while ago). What you did in 3 hours with nearly no break is what would typically take me a whole day (7 hours, or 5 hours moving). So you could probably do a tour like this in 2 weeks, whereas it took me nearly 3. :) If you can't take that much time off, you could always do a nice tour on a 2 or 3-day weekend. Looks like there are plenty of bike routes in the national forests around you (but probably in very hilly terrain). I am very impressed. Congrats! I'd love to have time to do the same kind of trip.